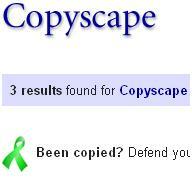 Copyscape is a plagiarism detection website. Just enter your site's URL and click search. I did a search for "copyscape.com" and got three hits, which goes to show how far its claims go. The makers of the site also provide a service called Google Alerts except they aren't affiliated in any way with Google. But aside from the idea that you can "protect" your site from being copied with a banner image, this is a useful tool if you want to see who is quoting your content out there without relying on trackbacks. Just type in your blog and find out what others are saying about you.